All of us have felt the transcendence that can come from experiencing beauty with a truly open heart. We crave this experience, but it's all too rare in our modern society. The constant hustle of everyday life leaves most of us too little time even to seek out beauty, let alone to spend time soaking it in and letting it open us. What would it be like to experience a society that deeply understands and appreciates the importance of beauty? Through art, music, dance, food, flowers, and more, the people of Bali infuse even the small details of everyday life with beauty and love. They also cultivate deeper connections, with a community that truly values every person. The modern world, though technologically advanced, can feel cold and impersonal, with most people becoming increasingly isolated despite our use of "social" media. To experience the warmth of a society that truly values each person can refresh us on the deepest possible level. The best way to connect with a sense of joy and transcendence is to spend time in a sanctuary like this, surrounded by a group of like-minded adventurers, who appreciate beauty, love, and connection. Allow your heart to open as you saturate yourself in the beauty and love that permeate every aspect of life in Bali. Open yourself to a true cultural experience, exploring Bali on all levels. We'll experience this incredible culture on as many levels as possible. We'll visit some of the many temples of Bali and experience their intricate art and architecture. 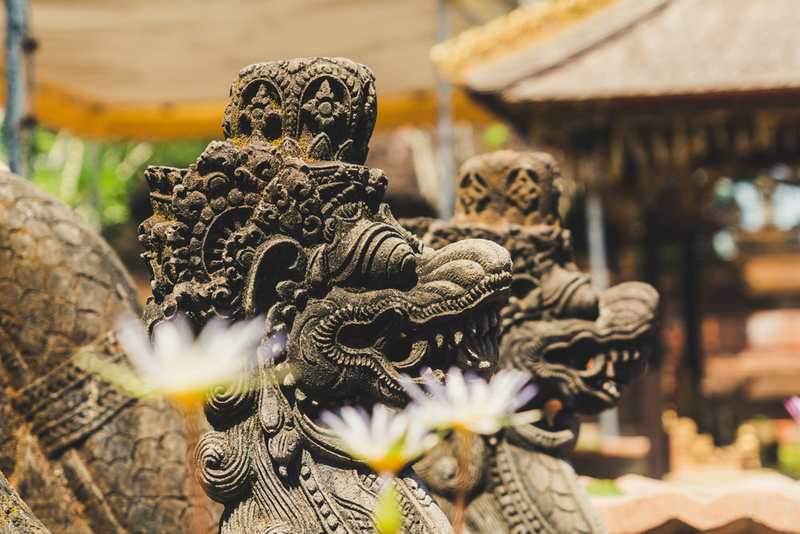 There are literally thousands of temples on Bali, and we'll have the opportunity to enter some of the most beautiful and striking of them, soaking in the sacred space. At Goa Gajah, the Elephant Cave, we’ll not only see the incredible carvings, but we’ll spend time deeply connecting to them and feeling their impact on us. Ritual is very important in Balinese culture, and we'll participate in this tradition. 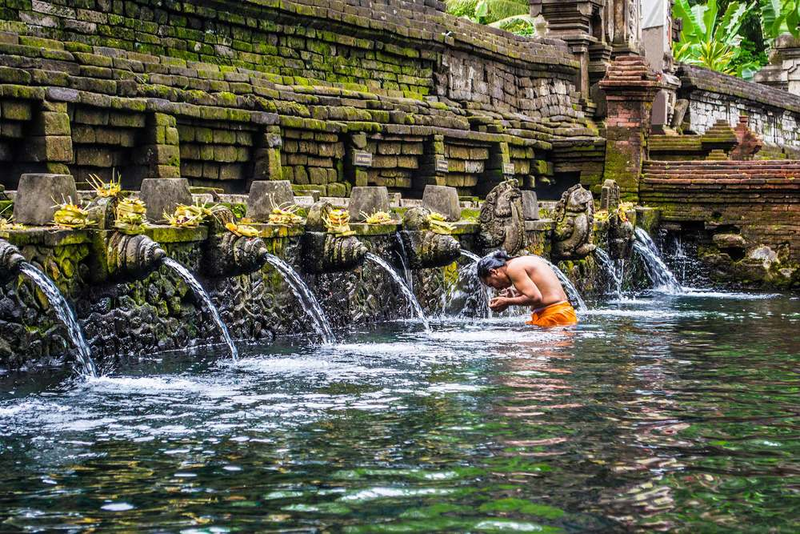 We'll visit Tirta Empul, the water temple of Ubud, where people come to bathe in the sacred healing waters. This water is said to remove negative energies and cleanse you on all levels. Before we go to the temple, we'll prepare ourselves through yoga and meditation, so we can release what no longer serves. Dance is also a sacred Balinese art form, and we'll have the opportunity to witness a Balinese ritual dance. Later, we’ll create our own sacred embodiment, exploring what it means to possess a physical body and to enjoy the feeling of allowing it to move. At the Monkey Forest, Ubud’s famous temple, we’ll play with connecting to those of other species. Though they look so different from us, these creatures want to be loved and to connect, just as we do. The Balinese caretakers of the temple treat these animals as sacred. What would it be like to view nature in this way – not as an obstacle to human activity, but as a gift to which we can connect? Connect with yourself through movement and meditation. Yoon and I will offer daily yoga and meditation classes. If you're not a "yogi," don't worry – these will be all-levels classes, with plenty of modifications. Yoon’s yoga classes are playful, creative, and fun, and I know you’ll love them! Both of us always strive to create a sustainable yoga class, that will work for every body despite any physical limitations. Of course, yoga is always optional, and you can feel free to sleep in or relax instead! At all of my retreats, I strive to create the perfect balance between adventure and relaxation. Expect to maintain a sense of spaciousness, with plenty of time for rest and reflection. You may wish to journal, talk with your wonderful retreat-mates (aka new best friends! ), or just sit quietly and enjoy the beauty and tranquility of the area. Enjoy one of Bali’s premier retreat centers. The tranquil and beautiful center Fivelements has been chosen by some of the world’s most famous wellness professionals as the site for their retreats in Bali. (David Wolfe chooses Fivelements when he’s in Bali!) Every aspect of the space is thoughtfully designed to promote a feeling of expansion and peace, with an emphasis on the beauty in the details. Patti and Yoon look forward to welcoming you to the enchanting island of Bali. If you have any questions, please use the form below to get in touch with me. If you’re ready join us, you can reserve your spot here! A $300 nonrefundable deposit will save your space. The total investment for the Bali retreat is $2740 for a space in a shared double room, or $3540 for a single room. Your retreat investment includes accommodations, all meals, group activities, local transportation around the island, and tips for guides; everything except your international airfare, alcoholic beverages or extra snacks (beyond meals), souvenirs, and any spa treatments (such as massages) that you may choose to have while in Bali. We want you to feel completely relaxed and at ease, with all your needs covered!